Globe Electric 90670 4 Inch Outdoor Rust Proof Recessed Lighting Kit, Open Kit with White Finish. Rust proof and damp rated. Generates an overall wash of light, ideal for outdoor use. Quick and Easy Installation: includes extra-wide, patented clips that grip uneven holes and surfaces to secure effortlessly into position. Superior fit for a smarter, faster installation. Requires one PAR 20 50W bulb sold separately. Dimmable with recommended bulb. 5 year limited product warranty. The Commercial Electric 3 in. 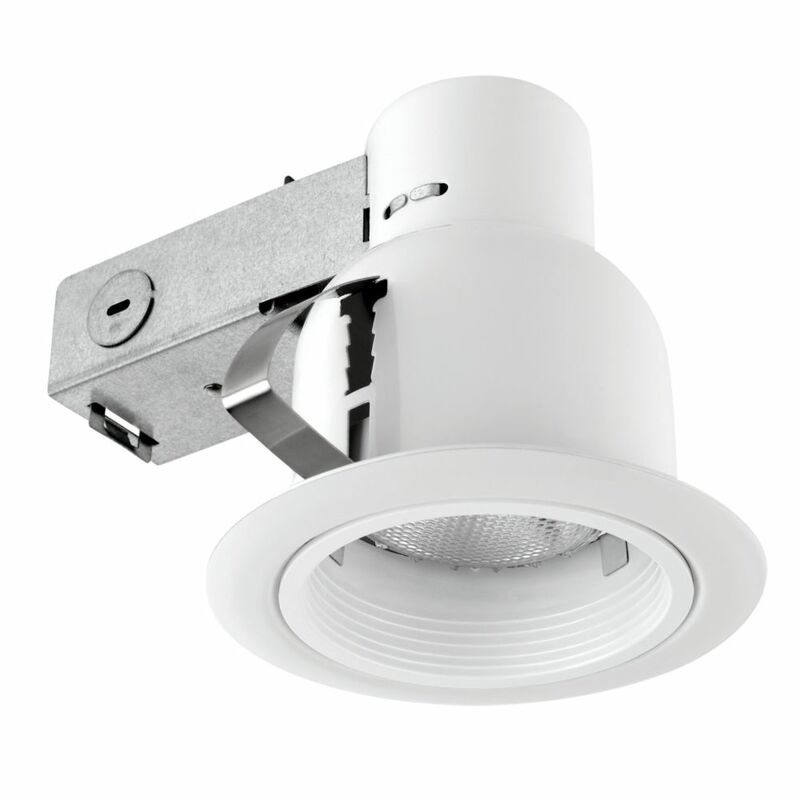 Recessed Light Kit includes a IC remodel housing and White Trim that gives GU10/50 Watt equivalent light output. Compatible with dimmer switch for different illumination needs and increased energy saving. ENERGY STAR certified airtight construction meets California Title 24 requirement. Rated for wet location make it applicable for shower and exterior application. The Commercial Electric 4 inch Recessed Light Kit includes a IC remodel housing and white trim that gives R20/50Watt equivalent light output-77% energy consumption saving. Compatible with dimmer switch for different illumination needs and increased energy saving. ENERGY STAR certified airtight construction meets California Title 24 requirement. Rated for wet location make it applicable for shower and exterior application. 4-inch Outdoor Rust Proof Recessed Lighting Kit in White Globe Electric 90670 4 Inch Outdoor Rust Proof Recessed Lighting Kit, Open Kit with White Finish. Rust proof and damp rated. Generates an overall wash of light, ideal for outdoor use. Quick and Easy Installation: includes extra-wide, patented clips that grip uneven holes and surfaces to secure effortlessly into position. Superior fit for a smarter, faster installation. Requires one PAR 20 50W bulb sold separately. Dimmable with recommended bulb. 5 year limited product warranty. 4-inch Outdoor Rust Proof Recessed Lighting Kit in White is rated 4.6 out of 5 by 13. Rated 5 out of 5 by Marthur from Look great! We bought these for under our eaves to light the walkway and they were a perfect fit and are great. They were the only ones that are rated for outdoor and so far the cold (-20) has not affected them. Rated 5 out of 5 by GF from Works great. installed 2 in our eave. works as advertised. Works great. installed 2 in our eave. works as advertised. Rated 5 out of 5 by Fred from Looking for a rust resistant outdoor light This was the second time I bought these lights. Ones bought two years ago still look new. No more painting every year. Great product. Rated 5 out of 5 by Don39 from Great lights Easy installation. Brackets worked well in soffit. Rated 4 out of 5 by Paul from Exactly what I was expecting. ... Exactly what I was expecting. Rated 3 out of 5 by Edi from I bought this fixture for my living room. First of... I bought this fixture for my living room. First of all no where on the box or on fixture I could find mentioning IC or NIC rated ( insulation or non insulation contact), till I check the manufacturer website and in there they say it is IC rated. But I think if you have an open Attic (with vent to outside air), either you shouldn't use this housing or you have to use a cover box on top of the fixture, because this fixture is not air proof and when you put the light bulb in there is a gap between the bulb and the housing, which is a good way for loosing heat or cold air, and also it is a good pathway for all attic bugs to your house. Rated 5 out of 5 by Michael from I installed 3 Globe 4" recessed fixtures in my hobby... I installed 3 Globe 4" recessed fixtures in my hobby area of the basement. The finished ceiling is lower here because of HVAC and had a tight fit in between duct work. The Globe recessed lights worked out great! Can i used led bulbs in them? My answer would be a probable yes. &nbsp;If the fixture accepts a standard light bulb, say 60 watt, 125 volt then everything should be fine as the thread on the base of the bulb is the same, voltage is the same and the LED bulb runs much cooler. &nbsp;The issue with dimming is another story. &nbsp;You must buy LED bulbs suitable for dimming and your dimmer must be suitable for electronic loads. &nbsp;Both the bulb and the dimmer are marked accordingly on the outside of the package. Is there a special system for mounting these in/can they be mounted in aluminum, vented soffit (like these: https://www.homedepot.ca/en/home/p.4-panel-vented-soffit-10-ft---white.1000183430.html)? The answer is yes. Looking at the picture above you can see one of the two metal brackets and its adjustments at the top. &nbsp;This is what will hold the fixture against its bottom flange or ring.